I’ve often written about public libraries but not for some time. I have been spending a lot of time in them though lately, as I’ve been writing a book. It’s a book on the 50 year history of Liverpool Housing Trust, one of the ‘Cathy Come Home’ era housing associations and a place where I first volunteered and then worked in myself for 20 years from 1975. No doubt when the book comes out, which will be soon, little hints of what’s in it or long bits of what turned out to be too long to go into it will appear on here. I’m not writing it on my own mind. My friend and ‘proper’ writer and publisher, Fiona Shaw of Wordscapes is doing much more of the writing than me and also editing the whole thing. But we divided up the bits we’d do and mostly write on our own, getting together occasionally to see where we’re up to. And I’ve done most of my own writing of it in public libraries. In our grand and lovely Central Library when I wanted to lift my spirits and get going on what felt like a big project. 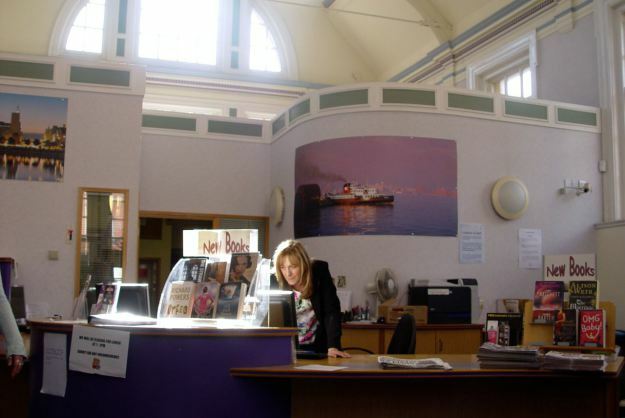 Then most often in my local library at Allerton Road as I’ve settled into the work and enjoyed every minute of it. Enjoyment much helped, as it’s turned out, by the kindness of public librarians. I gravitated towards doing the work in libraries because I like them, I’m at home in them. I’d turn off my phone and take no laptop or iPad with me, so I wouldn’t be digitally distracted in the ways so easily possible when working at home. Mail to check when it drifts in, Twitter too and that ‘Comment is Free’ article that might, only might, have something mildly relevant to say on the state of housing or society. All prevarication really to keep me from the business of actually writing anything down. Yes, this book is being actually written down. With pens on pieces of paper. At first I thought of doing this for the arty reason that if you’re writing a book about something that starts in the 1960s you should write it like they would have then. Then I found, or remembered, how much I love the feel of words flowing through me and onto a page. So I got well going in our beautiful libraries. 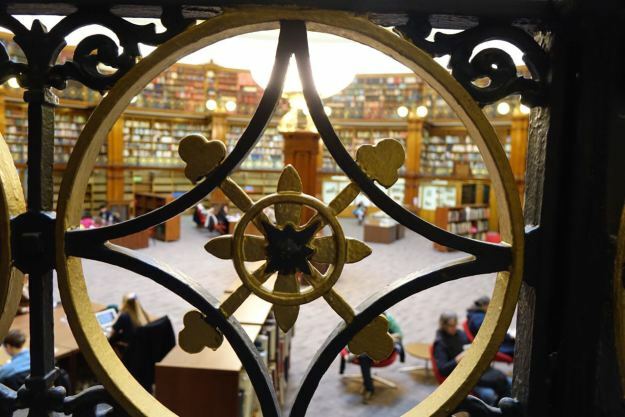 The great and silent Picton Reading Room. Which brings me to the librarians. Now I hadn’t gone to the libraries for silence. I’m in them enough to know that those days are long gone. (Except for in the great and grand Picton Reading Room at Central where it’s always sepulchrally silent.) No I like the noises in libraries. The children asking for another story or singing ‘Old Macdonald’s Farm’ like it’s just been written. The gentle enquiries about books, of course. This morning’s overheard gem was ‘Have you got anything written by Rudolf Hess?’ But what I confess to not having noticed before spending so long in their libraries lately, are the noises librarians themselves make. Hour upon hour writing through the decades I would be calmed by the sounds of politeness, understanding, intelligence, caring, patience and kindness coming from the librarians. No computer too impenetrable to sort out, no photocopier too fiddly to fiddle with, no problem too intractable to be interested in. This morning in Allerton Road two fairly demanding members of the public had turned up at the same time. Both needed special attention and both got it. A chair was repeatedly brought over to one who seemed to need it desperately, but only sometimes. At the same time as the other person, with barely any English, was calmly enrolled in the library and their complex and halting requests patiently listened to and understood. All of this carried out by a team of three dealing with a long queue of borrowers and questioners and a bank of partly frustrated computer users at the same time. Other than to contentedly notice it was happening it didn’t interrupt the flow of my writing at all. Because it was all done peacefully and with the constant feeling emanating from them all that to be a public librarian is a pleasure and a privilege. They clearly loved the work they were doing, and it’s always a pleasure to be in the presence of that. So thank you, you three this morning in Allerton and all of you others who’ve helped me so much with writing my bits of the LHT book. Not by knowing about housing or the social and political changes of the past 50 years, though I bet you do, but by being yourselves and enriching my world with the kindness of public librarians. 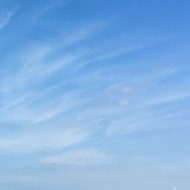 I was so impressed by all of you this morning that I was going to break the habit of a lifetime and come and tell you all on the spot what a great job you were doing. But one of you had gone on your lunch and the other two of you were clearly up to your eyes in well, being librarians. So I thought I’d write my thanks down and tell you and everyone else. 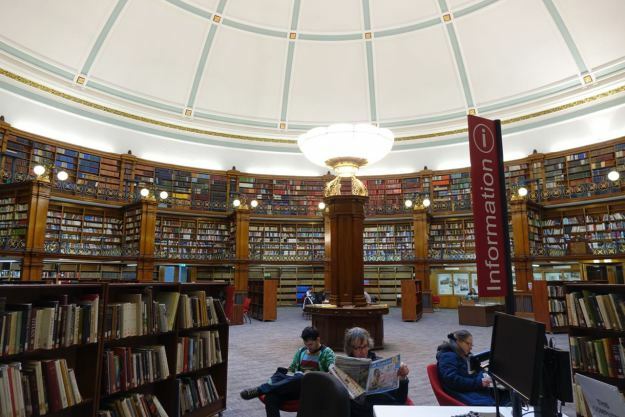 In what I’m sure is a difficult time, when the long term future of our libraries seems so unclear, you are all still providing oases of calm, efficiency and kindness all over Liverpool. Bless you for it, and again, thank you so much. And once again, a librarian at work, just so you know. Neither of the librarians pictured in this piece were in Allerton Road this morning. But I’m sure if they had been they’d have been equally kind. Granby 4 Streets: The Market’s back! Good to see a tribute to librarians. Not to take anything from your piece, but I’d like to point out that the staff you admire probably aren’t even librarians. As a lowly library assistant myself I staff the front lines. I am social worker, travel agent, handy person, childminder, stressed person soother, book tidier, advice giver to the public who use our library. Very often we feel like we’re on our own. It would be nice to see our grade get the credit. Librarians do valuable work, yes, but it is not the work you describe. Obviously I know nothing about grades. You’re all librarians to me. 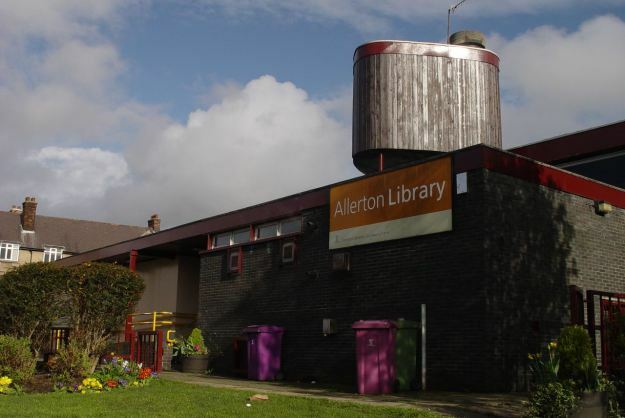 Liverpool ibrary is superb and as a former library assistant (my first ever ‘real’ job) I’m glad you still have a local library in Allerton, genuinely glad. They are places of refuge in many ways and about so much more than just literature. In a recent post of my own (among other things) I bemoaned the loss of the 2 libraries nearest to me, serving a combined population of 24,000 approx. From here the bus fare to the nearest public library is £4.40 return. 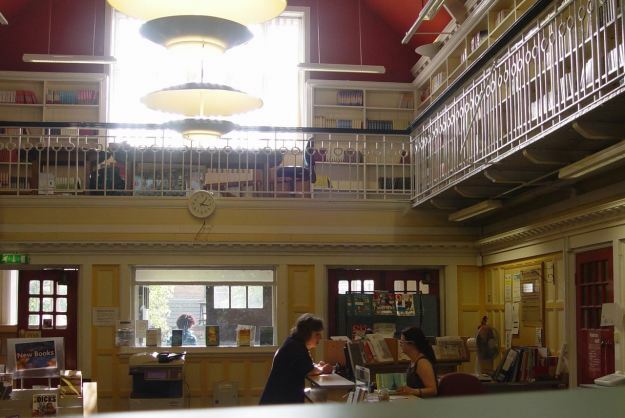 I think it’s much more than a shame we are losing libraries, I think in fact it is gross mismanagement of the nation’s assets by a government that appears to hate large sections of its own people. So I hope in five week’s time enough of us will exercise our democratic right to vote them out of power. Very nice post Ronnie. I echo what you say about libraries (and archives offices too). I have often eavesdropped on those difficult enquiries, sometimes by people who have a desire to trace their family trees and arrive with a snippet of garbled information from which they expect the librarian or archivist then to be able to produce a complete geneaology within minutes. Yes indeed, they really do have to be tactful and patient. I once went to a library (which I will not name) and asked for some specific local historical sources which I knew existed because I had consulted them about 20 years previously. The librarian had trouble finding them, but kindly offered me a book which he thought might have been of “some use” while I was waiting. It was of no use whatsoever, because it was written by me! I am glad you are enjoying writing your book. It is a very rewarding, if sometimes lonely, and exhausting task. Good luck with it. As I’m writing this with a friend I’m actually finding it very companionable Stephen. More like a conversation than an inner monologue. I work in a public library and I LOVE every second. We know the customers by name as they do us, we sirens menu hours chasing away to them about their latest read and recommending them similar titles. Whilst it can be super busy at times, we love every second and I truly believe that I have the best job in the world. It’s sad that the future of libraries is uncertain, but you have no idea how lovely it is to hear comments like these, so thank you. Not sure if ‘sirens menu hours chasing away’ is auto correct in overdrive but I kind of like the sound of it! We are quick to moan about poor service so it is great to hear about people who do their jobs well and, by turn, give so much pleasure to the people they ‘serve’. Thanks for helping us notice and appreciate librarians, Ronnie. P.S as always I’m catching up on your posts. Life just happening a lot here leaving little time for the distractions of social media!! !